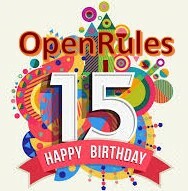 Today is exactly 15 years since OpenRules, Inc. was incorporated on Feb. 24, 2003. It’s a quite serious milestone, so I decided to write a few words for this occasion. A year ago, I described a brief history of our company and key factors that made it successful. 2018 was an extremely successful year for OpenRules as well: we improved the product and many major corporations became our new customers. But in this post I want to look to the future and to share some of our upcoming and long term plans. OpenRules is already a well-known Business Rules and Decision Management system used in real-world production environments by many corporations and government agencies worldwide. Thus, I want to assure our customers that OpenRules will remain backward-compatible and that their existing applications will continue to work with all future OpenRules releases. We cherish the already achieved level of OpenRules’s stability, and we will do our best to support the reputation of the highly reliable, well-supported, efficient, powerful and at the same time user-friendly product. A few years ago, while analyzing different products Forrester Research wrote: “OpenRules have the most-aggressive approaches to business-expert authoring and typically requires less developer support than IBM ILOG, FICO Blaze Advisor, and JBoss BRMS”. This remained true after we added executable decision models, and we expect it will be our guiding approach when we add new features. Integration with Amazon Alexa for Business. Making decision across multiple inter-connected decision models. So, stay tuned: The 15-year-old OpenRules (as the decision and knowledge management community in general) has a lot of ambitious goals and our research and development directions aimed at overcoming these challenges.